Please refer to our stock # 02079 when inquiring. 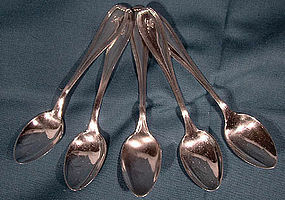 A set of six sterling silver 4-1/4" demitasse spoons in the Stratford pattern, issued c1925 by Roden Brothers, Toronto. These spoons are stamped with the Roden mark and STERLING (with two marked DINGWALL, the retailer), and each has an H monogram. This set is in excellent condition with no dents, bends, corrosion, losses, damage or repairs. Please note that there are six spoons included - our picture shows five. All items are thoroughly and conservatively graded and all condition issues are noted; all items are vintage or antique and may have slight signs of gentle use. Surface tracked shipping to the U.S. starts at $20 (other spots may vary, air is higher) - tracking and insurance are included in shipping quotes. Items paid with a credit card will be shipped to confirmed addresses only. We do ship internationally. All of our prices are in $US. PLEASE NOTE: we DO NOT accept PayPal, only VISA and MASTERCARD.